The resorts that comprise the Port Orleans area of Walt Disney World were not always tied together by name. 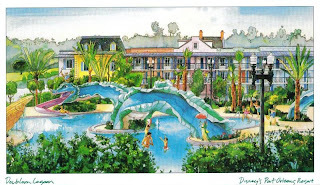 When Port Orleans – French Quarter opened in May of 1991, it was known merely as Port Orleans. 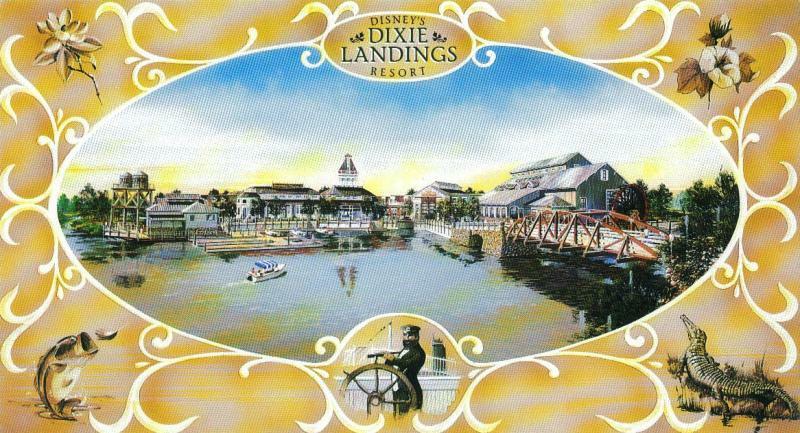 Port Orleans – Riverside had an even more drastic name shift, as when it first greeted guests in February of 1992 it was identified as Dixie Landings. In the Spring of 2001, the two resorts became part of a single Port Orleans region and were given their new identifying names. This merger also shifted the landscape as far as amenities were concerned, with some restaurant and rental services being shifted away from Port Orleans – French Quarter and over to Port Orleans – Riverside. While the names may have changed, the spirit of these two distinct expanses of Port Orleans has remained the same. In fact, looking back at the early postcards for these two resorts, at face value it would almost appear as if nothing had changed at all. The Dixie Landings postcard showcases a slower, simpler time where the river was king. Meanwhile, the Port Orleans postcard shows off the vibrancy and flourishes of life, and water still present, this time in the water color design of the card. Take a moment to step back to the early days of these two Port Orleans resorts and revel in the tried and true expression, the more things change, the more things stay the same.